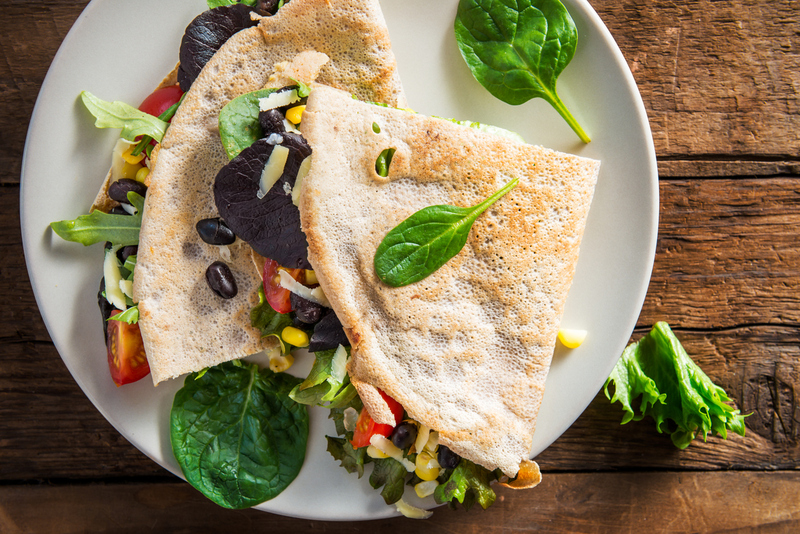 These spinach and black bean quesadillas are an excellent dish to make for any meal. They’re perfect for a weekend breakfast as a family before heading out to the day’s activities. Or, they make a great weeknight dinner when you don’t have a lot of time to cook. Not only do they come together fast, but they also taste great. With the eggs and black beans, these quesadillas are chock-full of protein! This meal is sure to prepare you for the day or perk you up after a long day. After you make these quesadillas the first time, they’ll undoubtedly become part of your meal rotation. Your whole family will request them all the time! And you won’t mind making them because they come together so easily. Their simplicity doesn’t take away from their taste. The flavors of the gooey cheese, savory eggs, and healthy spinach all come together for one delicious dish. Follow our spinach and egg quesadilla recipe below for your next amazing meal! Mix the eggs in a bowl with a fork until the whites and yolks are blended. Season with hot sauce, salt, black pepper, and garlic powder. Set aside. Heat the oil in a large cast-iron or nonstick skillet over medium to medium-high heat until it shimmers. Add the spinach and cook until wilted. Add the black beans and stir to combine. Pour the eggs over the spinach and black beans. Cook the eggs just until set, frequently stirring to cook evenly. Transfer the eggs to a bowl. Clean out the skillet. Take a paper towel and add some oil. Wipe the skillet with the oil. Warm up the skillet for a few minutes and add a tortilla. Sprinkle 1/4 cup of the cheese over one half of the tortilla. Once the cheese begins to melt, add a quarter of the egg, black bean and spinach mixture. Add more cheese if desired. Fold the quesadilla in half. Cook the quesadilla until the one side is crispy and golden brown. Flip it over and cook until the other side is also crispy and golden brown. Transfer the quesadilla to a cutting board and let it cool for one minute. Cut it into thirds or in half, as desired. Repeat for the other three quesadillas. Serve each one as they are finished cooking so they don’t become cold. If desired, top with cooked corn, tomatoes and other preferred toppings. You only feed your family the best food made from the best ingredients available to you. When you use Sauder Eggs, you don’t have to worry about quality. Our partnered farmers agree with us that we should only provide the best eggs for your family. Use our store locator to find the nearest Sauder’s retailer to you.